A disaster is any occurrence that causes suffering and creates human needs that cannot be alleviated without help. Disasters can occur at any moment and in any place. Pray for those affected. God can do far more than any of us to bring comfort to the hurting. Create a phone list of the vulnerable in your church and make contact with shut-ins, elderly, disabled, those suffering with chronic health issues, and single mothers. Train and mobilize volunteers to provide care at the church for children, elderly, sick, and/or the disabled. Provide bilingual interpreters to assist those who speak another language. Open the church to receive and distribute donated goods and bulk items for those affected, such as bedding, food, clean-up supplies, and household items. Offer logistical support to trained disaster relief teams by allowing them to be housed and fed at your church. Develop and organize clean-up or repair crews, such as chainsaw, debris removal, flood relief, and roof-tarping teams. Kentucky Baptist Disaster Relief provides training in these areas. 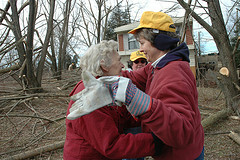 Encourage church members to become trained as Kentucky Baptist Disaster Relief volunteers. Training and preparation always makes us more effective in response and ministry. In most cases, the best way to help is through monetary donations. Financial gifts allow us to meet the specific needs of those who are hurting. They also provide the right resources at the right times, assist in long-term recovery efforts, and stimulate the local economy in the affected area. I know many people feel as if giving money is not personal. But, always remember, helping should be about meeting the needs of victims, and not fulfilling our desire to feel good about ourselves. If you choose to collect supplies, be sure that you have contacted someone on the ground to insure that you gather items that are genuinely needed and wanted. Do not create more problems by sending unwanted and unneeded supplies. As someone who has worked in many disasters, monetary donations, through reputable groups, make the most difference in helping people.